Hi everyone! My names Victoria India and I'm a 3rd year BA fashion design & production student, living just outside Leeds with my boyfriend Matt. I love cups of tea, orange chocolate and bubble baths. Im a real bargin hunter and I have a very recycled style of dressing. Im still wearing things I wore 3+ years ago! It’s always about making the most of what you got and saving your pennies. So why am I here? 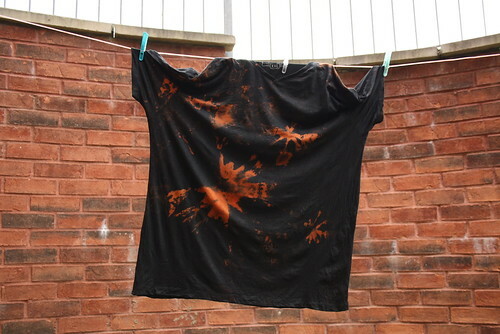 Well I thought I’d do a DIY galaxy t-shirt. Before deciding to make one myself I searched for hours on the internet trying to find a cheapish one on a clothes website (see, a real bargin hunter) but alas, I found nothing, or ones that were at least £40. For a t-shirt, I don’t think so. So when I came across this post I thought YES! Result! What I then did was buy a plain black mens t-shirt for £2 from Primark. I wanted a really big one so I could get the most out of it.I got some bleach, rubber gloves and elastic bands. Here’s what I did: Section off where you want the bleach, and tie around with elastic bands. 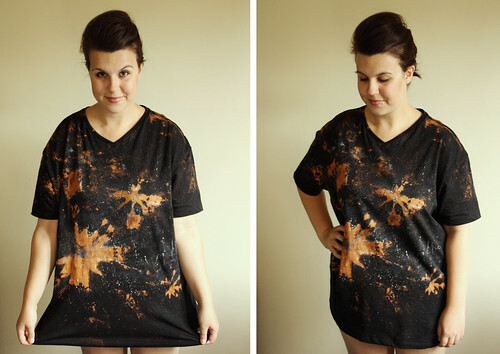 I did about 2 large ones and a couple of smaller ones (like tie dye). Leave for no more than 3 minutes and then rinse through. The next day after it was dry I brought some Acrylic paints, I find them really easy to use and they’re quite solid in colour. I got a 10 colour set for £10 which isn’t bad at all really. Then all I did was flick paint on, using different size brushes and different thicknesses. The good thing about using these paints is that the dry really quickly. It’s not the best, but I don’t think it’s bad for a first go and it’s something I’ll try again. Wow, fabulous post! I'm so impressed with your creativity - thanks for the how to! This is really good :) I would be useless tho haha!